Trees in an urban environment, such as London and its surrounding boroughs, need to be carefully maintained and an experienced tree surgeon can provide a regular programme of maintenance to ensure their continued health. Landowners are responsible for damage or injuries caused by trees on their land and have a duty of care to prevent foreseeable harm to passers-by from any hazardous trees situated on their property. Trees need to be assessed regularly and managed to keep risks of causing harm or injury low. A reputable tree surgeon will be able to assess the risks posed by your trees and will be able to estimate the likelihood of structural tree failure. They understand the mechanical properties of tree roots and stems and their likelihood of failure in high winds as well as being able to spot diseases such as honey fungus and bracket fungus and be able to gauge the level of threat to the tree. 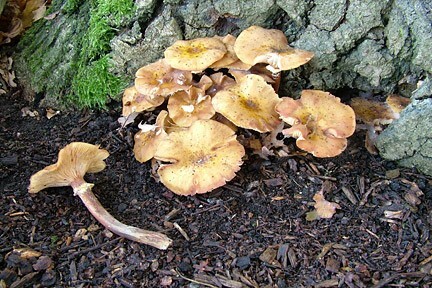 Honey fungus is the common name of several species of fungi within the genus Armillaria. It spreads underground, attacking and killing the roots of perennial plants and then decaying the dead wood. It is the most destructive fungal disease in UK gardens. Trees usually don’t grow straight, and a little leaning away from the prevailing wind is normal. But if your tree starts to visibly increase the degree of lean, it may be because of poor weight distribution or anchor root damage. It is likely to be unstable and you should enlist the services of an experienced tree surgeon to assess it before any damage or injury is caused. The danger signs are cracked or heaving soil, especially on the side opposite the lean or exposed roots around the base of the tree. A tree with multiple trunks, or with splits in one trunk, can be unstable. V-shaped or U-shaped multiple trunks are weak points for mature trees. The connective wood where the trunks come together may lose strength — and be more likely to split — with age and when storms occur. Cracks that extend deeply into or through the trunk can lead to the tree splitting in half or heavy branches falling without warning. Building work can have a detrimental impact on the health and stability of trees on trees. Installing a drive, building an extension or digging up utility lines puts nearby trees under stress. Excavation work can damage shallow feeder roots, starving and destabilizing the tree. Building equipment can scrape tree bark, providing a gateway set for disease and infestation. The experienced tree surgeons at Take A Bough Tree Care can assess the problem and provide viable solutions from, pruning, limb removal or if necessary removal of the tree. In this latter case they will provide advice about suitable replacements and can obtain and plant these on your behalf. "Toby did a very good job, not only with trimming a tree and ivy that were abandoned and out of control, but also with leaving the house clean and all my neighbours happy."